On our way home, we found ourselves traveling right through the area my parents were stationed at when I was born...George Air Force Base in Victorville,CA. I have never been back to the area, so I couldn't resist taking a look. 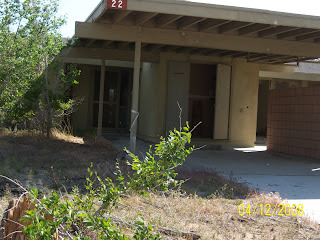 Sadly, the base closed back in the early 1990's and almost everything has either been torn down or vandalized. 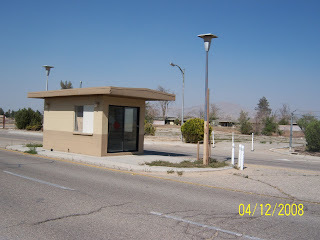 The above pictures are of the "family" housing units where we would have lived and the security gate at the main entrance. Seeing this was so neat, yet very sad. Sometimes I wish I could travel back in time and see my dad in uniform and my mom raising 4 little girls in that tiny house! wow, that is sad looking. I remember the base, sort of. I remember one apt on the top of a hill becasue I went down that hill in a wagon and go hurt and also decided to run away from home.....al the way to the neighbors house.